However, the advent of notation led to the development of polyphony: the simultaneous sounding of many interweaving melodies. In polyphonic music, more than one “melody” happens at any given time, overlapping and interweaving with one another over long eriods of time. usual for such a symphonic piece to be additionally punctuated by percussion (triangle, cymbal, xylophone, side drum, and timpani) and be joined by the remaining brass (trumpets, trombones, and tubas). Indeed it can work with each of three instruments working in different keys. This is polyphony. It can theoretically be either “harmonious” (i.e., attaining certain culturally conditioned aesthetic standards) or “dissonant” (displaying an apparent lack of agreement or tension between the notes). As Cunningham notes, the chief attribute of polyphony is, “Simultaneous, non-excluding difference: that is, more than one note is played at a time, and none of these notes is so dominant that it renders another mute.” (Cunningham, These Three Are One). Hence, polyphonic music permits and encourages individual difference, yet unites them in what might be deemed a community of melodies. Drawing on this metaphor provides a valuable insight for a theology of community and enables an examination of diverse melodies of belonging. The cantus firmus then lent its form to derivative melodies that fragmented, mirrored, echoed, and retextured the original melody in other voices. These countermelodies and harmonies could weave their way together with or even against one another, but as long as each remained in relation to the cantus firmus, the music could continue. Melodies of a New Monasticism employs these metaphors of cantus firmus and polyphony to investigate the nature of Christian community: if Christ is conceived as the cantus firmus of all Christian living, then his “solid song” will be fragmented, mirrored, echoed, and retextured within a variety of people whose own diverse and individual melodies only find their unity, indeed their community, in Christ. Craig Gardiner is Tutor of Christian Doctrine at the South Wales Baptist College. 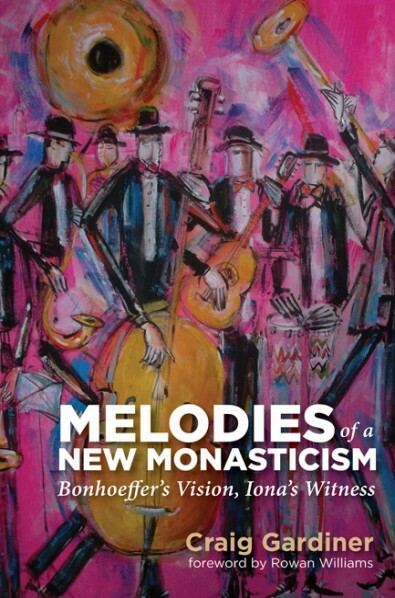 Melodies of a New Monasticism is published by SCM Press next month. The lion is God – of course, how could God be anything else? Somehow, I knew this deep down in the marrow of my being, but I did not know that I knew it. As Donovan explains this metaphor that he received from the Masai elder, it all made sense. As NZCMS mission partners, we did not go to Congo to help the Congolese discover God. The lion was already there. Goodness, mercy, love, forgiveness, the divine presence – they were already there. How could they not be? In his superb book, Christianity Rediscovered Donovan reminds us of exactly that. The missionary is the one who rediscovers the gospel for themselves. The missionary is their own first convert. This is not necessarily from theology books but rather from first-hand experience. Donovan writes, “if a theology did emerge from my work, it would have to be a theology growing out of the life and experience of the pagan peoples of the savannahs of East Africa.” (22) That was one of my first lessons in mission. I am the convert. I am the one in need of saving. Hopefully, that gives one a little humility. I am entering someone else’s garden (to pick up Bevans and Schroeder’s metaphor) respectfully, humbly, in bare feet so I tread respectfully and do not trample others’ dreams. I dream of a “missionary option”, that is, a missionary impulse capable of transforming everything, so that the Church’s customs, ways of doing things, times and schedules, language and structures can be suitably channelled for the evangelization of today’s world rather than for her self-preservation. This is the clarion call to contextualization. We have long known that contextualisation is a missiological imperative and in a sense, this ultimately means letting go of the gospel for the sake of the gospel. This is what Donovan discovered in his encounter with the Masai. We do not have to look back very far into mission history to see the damage outsiders have done to the local cultures, customs and context. Outsiders have to practise letting go. This also means practising attentiveness – really seeing and really listening. This takes a real self-discipline and means genuinely practising kenosis. We need to let go of our cherished ideas and beliefs, our ways of doing things and of seeing reality, our habits and postures for the sake of the gospel. In a sense we have to let go of the gospel for the sake of the gospel. Unless we risk losing the gospel we may never see the gospel become an integral part of the culture nor understood in a way that is meaningful for that culture and context. For this to happen there needs to be more freedom, less judgement, more risk-taking and therefore not translating it back into something that we can necessarily understand or handle. We need to allow these risks to be taken and not to be fearful as fear stifles creativity, imagination and courage. We need to encourage an adventure of the imagination that enables the gospel to be fleshed out and understood from within the cultural context. And this is also the challenge of mission in the UK where we are in a situation where we have never been before. Church attendance is declining and it seems the gospel is a distant memory, if even that. How do we go from here to the new place? What will that look like for the communities we are in? Where do we start from and will we recognise it when we get there? We need to let go of power, of status, of control, of our way of doing things. We need to listen more – just as Donovan listened to the marvellous stories of the elders. We need to see what is around us – not just look but see, with the eyes of the Spirit. We need to ask questions and to be genuinely curious. We need to let our imaginations roam freely so we can experiment with what might be possible. We need to embark on an adventure of the imagination. I see glimmers of hope – especially among the pioneers for whom Donovan’s book has been extraordinarily influential. Pioneers are crossing borders and trying out new things – they are entering into others’ gardens and joining in with the energies flowing in those communities. There are pioneers who are starting up boxing clubs, creating a group for classic car enthusiasts, setting up bike repair shops and apprenticeships, creating a cleaning company that pays a legal minimum wage, community choirs, community gardens and so much more. Some things fly and others don’t. I don’t think that matters because the imagination is there and the realisation that this community has dreams, visions and ideas of its own. This is why it is important to be there, to be part of the community, to live there and become part of the “we” instead of the “they”. Then a theology emerges from the local context, as it did for Donovan from the savannahs of East Africa. A theology begins to emerge from the lived relationships, the shared experiences and the new discoveries of trying together to appropriate Jesus for that particular context. Cathy Ross is MA coordinator for Pioneer Leadership Training at CMS. She is a lecturer in Contextual Theology at Ripon College Cuddesdon. She is the author of numerous books including Mission on the Road to Emmaus. Her new book Missional Conversations, co-edited with Colin Smith, is published in the autumn. Is Your Bank Statement Pants? In today’s guest post Eve Poole, Third Church Estates Commissioner and author of Buying God: Theology and Consumerism (published next month), reminds us that consumerism is a game we simply cannot win. Do you remember that famous scene in Bridget Jones where, in the middle of his seduction, Daniel Cleaver discovers she’s wearing enormous pants? Mortifying. I think that’s how we feel about our bank statements. Do you show yours to anyone? I wonder why not. Perhaps it might lay you bare. Your bank statement is an extremely raw account of your choices, and each choice tells us something about you. A bit like staring into someone’s eyes for too long, perhaps we don’t really want to be found out. What do you spend your money on, where, and in what proportion? What would it take to make you feel comfortable enough to show it to your partner, your friends, your mother, your neighbour, your boss? I’m trying hard with mine. I’ve started coding each transaction red/amber/green depending on how ethical it is. Definitely green for charitable donations, well-earned income, and buying locally. Amber for those lazy purchases that are more cheap than ethical because I’m in a hurry. And bright red for those emergency one-click present orders when I’m in danger of missing a birthday. “I was afraid because I was naked, so I hid.” With these fatal words, Adam ushers in consumerism. Well, Eve does, actually, that much-maligned truth-seeker. But the second they reach for the fig-leaves a truth is indeed exposed. Cinderella wore court dress, Eliza Doolittle wore an Ascot hat, and woe betide the small girl nowadays who does not have something Frozen about her. In dressing ourselves in order not to be naked, we immediately extend our coverings for warmth and protection into opportunities for display and social signalling. What we wear is the visible sign of our inward hopes and fears, our sense of tribe, and our desired status. This used to be controlled by sumptuary laws. For instance, in the reign of Elizabeth I there was quite a strict code governing the wearing of fur. For example, as at 15 June 1574, fur could only be worn by those worth over 300 marks a year, and they could only wear pine-marten, grey civet or lambskin. If you wanted to upgrade to grey furs, you had to be earning over £100 a year, or be the son of a knight. Then there was a progressive hierarchy – with fines payable for faking it – through leopard (ambassadors and knights) and lynx (dukes, marquises, earls, viscounts and barons) all the way to sable (the Royal Family). But isn’t this dress rather than consumerism? Yes and no. As Peter Sedgwick has argued in his book The Market Economy and Christian Ethics, consumerism is ultimately the search for self-identity, and we establish that socially through feedback from our peers. Not content simply with what we wear, we now extend our identity through accessories, cars, brands, education, occupation, and language. Our homes and families become part of the display, and we reveal ourselves through the full range of our life choices. Some do so more than others, of course; it depends on how much they rely on the opinion of others for self-worth. So it is no wonder that consumerism is out of control, because it is a game we cannot win. Colin Campbell, in his book The Romantic Ethic and the Spirit of Modern Consumerism, explains why. Consumerism is driven by an un-holy trinity: insatiability, novelty, and subjectivity. But nothing is new for long, and obtaining something merely triggers a longing for the next new thing, ad infinitem. Then our very subjectivity as humans draws us into aspirational day-dreaming, which ratchets up the other two, into a never-ending spiral of disappointment. As soon as we plug one gap, another one emerges, and we are doomed to frustration. Yet religion can console in a way that consumerism cannot. Our overwhelming and entirely natural desire for self-identity, which these days we tend to channel into consumption, could be met by spiritual goods instead of material ones. The logos and not the logo. But the siren call of commercial advertising drowns out our spiritual truth, that you only ever truly find yourself by losing yourself in God. Because our promises will be met in the life to come and not now, those who have lost faith cling instead to the alluring promises of jam today. So we need to stand up. We need to find our voice. We must show the lost that we are found, and that they can be too. And how can we do that? By being salt and light. By being so alluringly secure in God’s love for us that other people yearn for what we’ve got. And we can start that right now, with that embarrassing bank statement. Can you turn every red to amber, every amber to green until this report card of your consumer behaviour becomes a beacon of love? Because if we don’t, who will. Buying God: Consumerism and Theology is published next month, but you can preorder a copy now, via our website.